Charleston, W.Va. – This week, Chancellor Paul Hill sat down with a group of seniors at St. Albans High School to discuss their goals for life after high school, why college is important for their futures, and how they can succeed in postsecondary education. 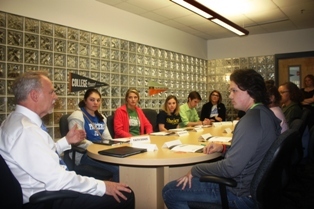 This discussion came during College Application and Exploration Week, an initiative coordinated by the College Foundation of West Virginia that provided college help and information at more than 400 elementary, middle and high schools across the state. Joining Chancellor Hill were St. Albans High School Principal Jeffrey Kelley and Counselor Lou Varney. Above: Seniors at St. Albans High School join social media campaign to share their college and career goals.